Combine the soy sauce,mirin and sugar. Cut the chicken into 2cm cubes and toss in the corn flour. Heat the oil in frying pan over medium heat,add the chicken and cook for 2~3 minutes until lightly browned. Turn the heat off (it’ll stop burning teriyaki sauce)and add the soy sauce mix into the pan. Turn the heat on,turning chicken constantly until well coated with slightly thickened sauce. Keep chicken and sauce in the fridge till cool down. Place chicken and sauce on pizza base. Top with the mozzarella cheese,onion and mushroom. 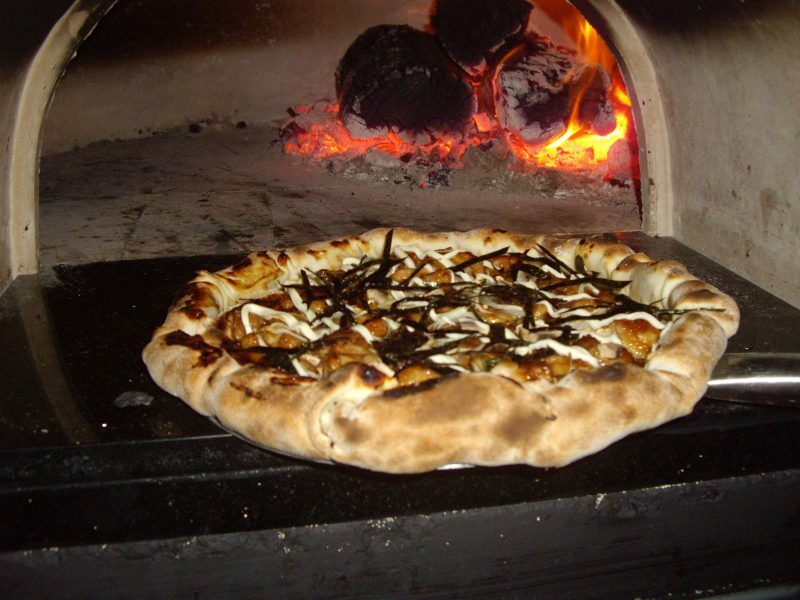 Cook pizza in the woodfired pizza oven.